And **Really** annoyingly T10 Unmap has been disabled by VMWare in 5.0 and 5.1 and cannot be re-enabled, reclaiming space is now a very manual task. Hi – I’m relatively new to storage but I think that a big caveat to SAN device thin provisioning is Storage DRS. 1. SAN device overcommit in place where total LUN sizes exceed physical storage such as 10TB total space, but 15 thin provisioned 1TB LUNs created. 2. Multiple SAN devices used. 3. VMware datastores created mapped to each LUN (from multiple storage processors) and added to Storage cluster with sDRS enabled. The sDRS problem wouldn’t show up if only a single thin-provisioned SAN device is used. Instead, simple VM creation / increased disk storage would at some point fail. Presumably storage admin gets an alert long before the overcommit truly occurs so the danger here is pretty low. With multiple SAN devices the situation is different and the sDRS auto-balance feature could definitely cause a problem. Consider if sDRS looks at freespace on each datastore and makes it load-balance decisions to storage vMotion vmdks. That could easily cause a mass migration to an “available” SAN storage device that uses array-level thin provisioning. In that case – the Storage vMotion might occur too quickly for the storage admin to fix. Your are correct in that a full understanding of all technologies and their upstream/downstream impacts is needed to properly draining, deploy, and manage a virtualized datacenter. 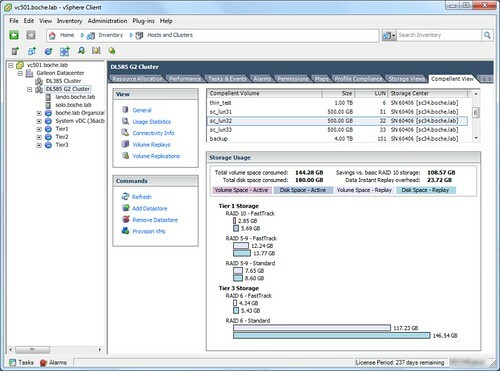 As you point out, some of vSphere’s advanced storage features don’t integrate seamlessly with modern virtualized storage arrays. I’m looking for a way to change the default “disk format provisionning”, do you know it ? Thin Provisioning Links » Welcome to vSphere-land!